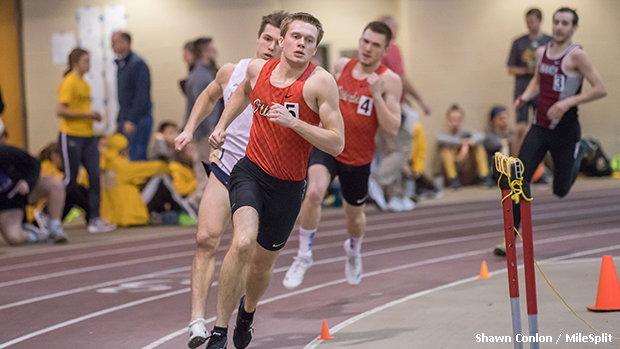 Otterbein's Nathan Forney continued his strong indoor season at last weekend's Dave Lehman Invite with a victory in the 500m contest. The former Waterloo representative went 1:06.88 for what was his fourth first place finish of the campaign. Forney previously collected wins at the Tiffin Alumni Open (200m and 400m races) and at the Otterbein Invitational in the 400m event. * Update (January 24th): This article has been updated and now includes performances from the elite division at last weekend's National Pole Vault Summit. * Note (January 22nd): Performances from the National Pole Vault Summit, including Matt Ludwig's (University of Akron / Lake Catholic) vault of 18-8.75 (5.71m), will be added to our database. This article will be updated to reflect those changes.